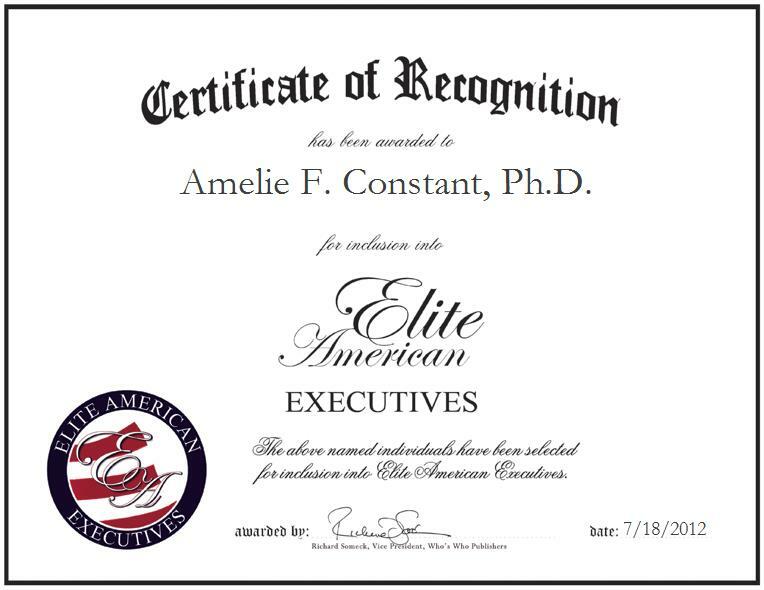 WASHINGTON, DC, July 18, 2012, Amelie F. Constant, Ph.D., Executive Director of DIW DC, has been recognized by Elite American Executives for dedication, achievements, and leadership in economic research. Dr. Constant has spent nearly two decades working toward her goals to conduct research that would help individuals and groups to make new and exciting discoveries. As the executive director of DIW DC, a nonprofit economic education and research institution, Dr. Constant conducts complimentary research and disseminates knowledge upon those with whom she works. She serves as a visiting professor at the Elliot School of International Affairs at George Washington University, and also as the vice dean of the graduate center at the German Institute for Economic Research in Berlin and the deputy program director of migration at the Institute for the Study of Labor. Motivated by a long-standing interest in carrying out high-quality, effective research, Dr. Constant followed her dreams and pursued her current career path more than 16 years ago. She feels that sheer hard work and perseverance has allowed her to accomplish her goals. Specializing in economics of labor and migration, Dr. Constant has been fortifying her strengths in teaching, conducting valuable research and communicating with academic leaders from around the globe for many years. She currently studies minority populations and the way that emigrants behave. She established her career as an economist due to her fascination with human behavior. Dr. Constant currently works for DIW DC, a private, nonprofit, nonpartisan economics institution. The institute focuses on current and emerging socioeconomic issues, both domestically and internationally, and engages its participants in educational and research activities. At her post, she is in charge of writing reference papers and books for conferences, working with students, and maintaining relationships and collaborating with institutions in Germany, France, Greece, Africa and China. She also offers classes and internships to first-year Ph.D. students. Dr. Constant holds a Bachelor of Arts in Economics and Mathematics from the University of Athens, a Master of Arts in Economic Development from Université Panthéon-Assas, and a Ph.D. in Labor Economics and Econometrics. Over the course of an illustrious career, throughout which, Dr. Constant has remained passionate about learning and growing, Dr. Constant also completed a postdoctoral fellowship at the University of Pennsylvania. For more information about Amelie F. Constant, Ph.D., please visit http://www.amelieconstant.com. Contact Amelie F. Constant, Ph.D.